This article will be a short overview of the techniques that Orson Welles was responsible for popularizing, with a particular focus on Citizen Kane (1941), his most widely known film. Welles was an innovator and absolute genius in his field. 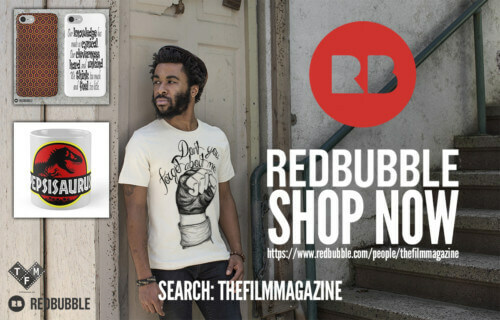 He experimented with camera lenses, lighting and sound to achieve something unique and often replicated in the years since. He was an all-round artist who excelled as an actor and director but also as a producer and writer. On a personal note, I was fascinated by his works form a young age, as much as I was with Charlie Chaplin’s, and I started digging into his life and career. I discovered that his personal experiences and what he went through as a child and young man were one of the reasons (or at least the main reason) why he was driven towards the arts – first painting and then acting and directing. 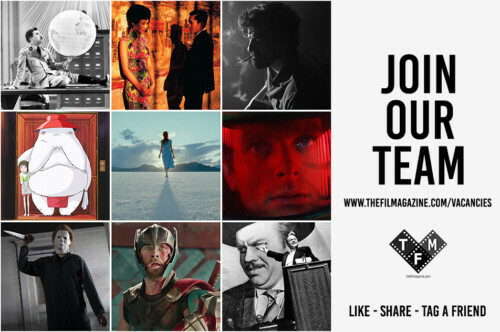 If you think about the modern film industry – not taking into account the Silent Era, in which Charlie Chaplin and Buster Keaton were undeniable masters – you can bet that almost every technical innovation regarding sound, lighting and camera angles was probably popularized or started by Orson Welles in collaboration with cinematographer Gregg Toland. Welles became famous worldwide with Citizen Kane (1941) which he directed and starred in as the lead character. 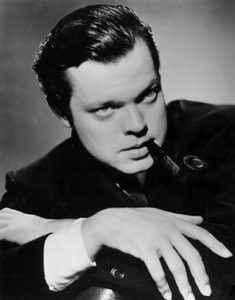 The film was produced by the RKO which decided to give to Welles an exclusive contract to produce the film, after being amazed by Orson Welles’ radio performance of The War Of The Worlds. They gave him free rein to do as he pleased and most importantly to have final cut privileges. Citizen Kane is loosely based on the life of newspaper tycoon Hearst, but also on Welles’ troubled and unhappy childhood. 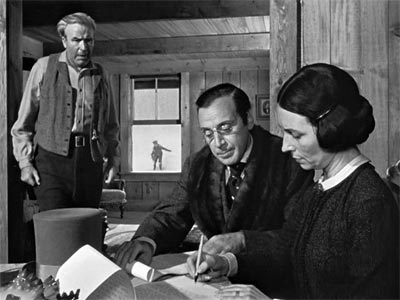 In this film cinematographer Toland experimented with what were to become the trademark techniques of Welles’ films, such as the long take, deep focus, and the use of the lighting and chiaroscuro. The deep focus technique was used in many sequences in the film and it was supported by long takes and the use of a wide-angle lens. In Citizen Kane there are different shots that show us all of the characters all in focus although they are positioned at different distances from the camera. The frame below is an excellent example of the use of deep focus since we can see young Kane playing outside in the snow at the same time as the other characters who stand closer to the camera, allowing for the mise-en-scene to tell stories of distance and entrapment on a metaphorical level, as well as two different literal stories – that of the child’s enjoyment at playing in the snow and that of the adults negotiating. What really strikes the viewer is also that in every scene it is possible to hear what each character is saying, whether they be close or far away from the camera, thus giving preeminence to sound, which is telling and relevant in many scenes that were at the core of the development of Kane’s character. An example of this is the scene I described above, where young Kane playing in the snow can also be heard shouting ‘ the Union forever’, as his parents talk to Mr Thatcher, thus the voices of all characters overlap. Welles was also particularly skilled in the use of low-angle shots, notable examples of which can be found again in Citizen Kane. These shots made the characters look incredibly tall, almost disproportionate to the space they moved into – and thus gave a claustrophobic quality to the scenes. 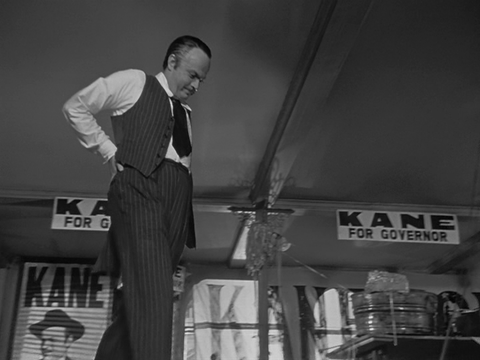 For example, in the confrontation scene between Kane and Leland, after Kane loses the elections, Welles made use of low-angle shots. The result is a towering image of Kane, that looks as if he is about to bump his head against the ceiling above him – something that was hugely symbolic. Welles even resorted to cutting holes in the set floor so that the camera could be positioned at the lowest angle possible. When you watch an Orson Welles film, you should also pay attention to every single and apparently insignificant detail – some of which I didn’t spot the first time I saw Citizen Kane – because they all hold special significance in the story and in reference to the characters’ personalities. The use of mirrors in Welles’ films is a key element to convey the complexity of the characters’ inner selves. 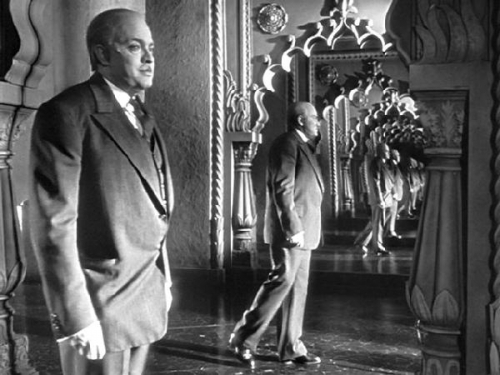 In Kane, for example, the mirror literally reflects the impossibility to pin down the title character’s personality, which seems to lose focus as the image is reflected by multiple mirrors. 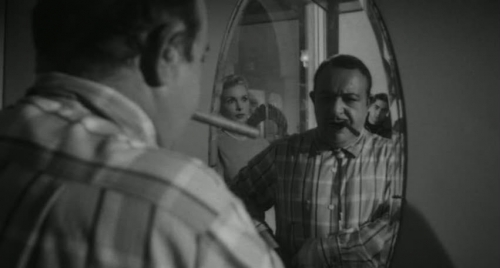 In Touch of Evil (1958), mirrors play an equally significant role. In this particular shot, the use of a mirror allows for characters at different distances from the camera to be included in the shot – notice that they are all in focus – but it also stands for the identification of the character in front of the mirror (‘Uncle’ Joe Grandi) with his imprisoned brother. Citizen Kane was the only one of Welles’ films not to be edited by the production company, in this case RKO, because every one of Welles’ films after that was changed or modified in post-production in order to make them more appealing and understandable for the American public, using a very specific and codified language that was popular during the 40s and the 50s – the so-called Classical Hollywood era. All the scenes had to be easily read by the widest possible audience and the way each shot was carefully composed wasn’t actually so easy to read. For this reason, sometimes the production company added entire shots to Welles’ films, to clarify and explain some points – as was the case with The Magnificent Ambersons (1942), where the close-up of the leading actress was entirely the doing of the production company. As a rule, Welles did not favour close-ups. One of the main reasons Welles’ films were difficult to understand for the average public was that he used different techniques I mentioned above to convey a complex meaning on different levels. Therefore, you had to watch closely for every change in lighting, camera lenses, sound and so on, to fully understand and enjoy the stories of his films. In short, I learned that with Orson Welles nothing is left to chance, and even though you may be familiar with his technique, you need to observe every scene as if under a magnifying glass in order to truly savour his masterpieces and understand their deep symbolism. Bazin, André. Che cosa è il cinema? Translated by Adriano Aprà, Garzanti, 1999. Bazin, André. Orson Welles. GS Editrice, Santhia, 2000. James Naremore. Orson Welles. Ovvero la magia del cinema. Translated by Daniela Fink, Marsilio, 1993.